Happy Saturday to all my blog friends. Today was a great day for me. I spent most of the day at the Scrapbook Expo in GA and got some new goodies to play with. 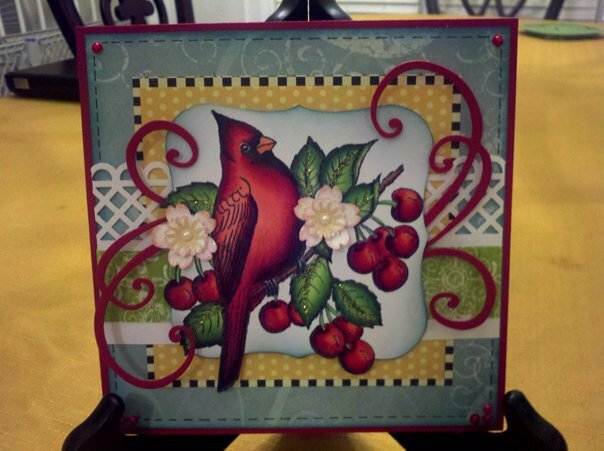 Anyone who knows me, knows that I have a thing for Cardinals and when I saw this stamp from Heartfelt Creations, I just knew it had to come home with me (ok, a few more fell in my basket as well). I couldn't wait to get home and color it. I don't think you can see it in the photo but there is glossy accents on the cherries. The Card is colored with copics and there are a variety of papers from my scrap stash. The swirls are doohickeys from Magnolicious. This is gorgeous Julie. I too love Cardinals. we don't have them in Australia. I love how you colored it. It is so rich. terrific job and lovely layout. That is beautiful! It would make a wonderful Christmas card as well. I shy away from birds as I don't color them well. I need a lesson or two from you! Wow this is gorgeous!!!! Wow what a wonderful piece of work!!!! Great job!!!! Fabulous card, Julie! I love the bright, vivid colors!! It just pops right off the screen at me. Beautiful coloring and design! Heartfelt Creations has some beautiful stamps. I saw them at a convention in Texas and later ordered several. In fact, I may have ordered this stamp! Your card is just stunning. What Copics did you use on the cardinal?